Our team at Chestnut Ridge has been working in the wedding industry in Western North Carolina for many years and we've had the privilege of connecting, working, and designing with the top vendors across our marketplace. These vendors have been hand-selected by our team based on their talents, experience, and exceptional careers within their trades and we are so excited to offer their services to our Chestnut Ridge guests. Taylor Gregg, Founder & Owner of Chestnut Ridge believes it’s important for our brides to be services at the highest level. Due to the volume of weddings we service at Chestnut Ridge and the variety of brides we serve, we have developed our in-house planning services through White Magnolia Planning. We work alongside all of our vendors to ensure you have the best day possible. With over 6 years of experience in the Wedding Industry, we believe knowing our venue the best and our vendors intimately will help create the perfect wedding day for you! 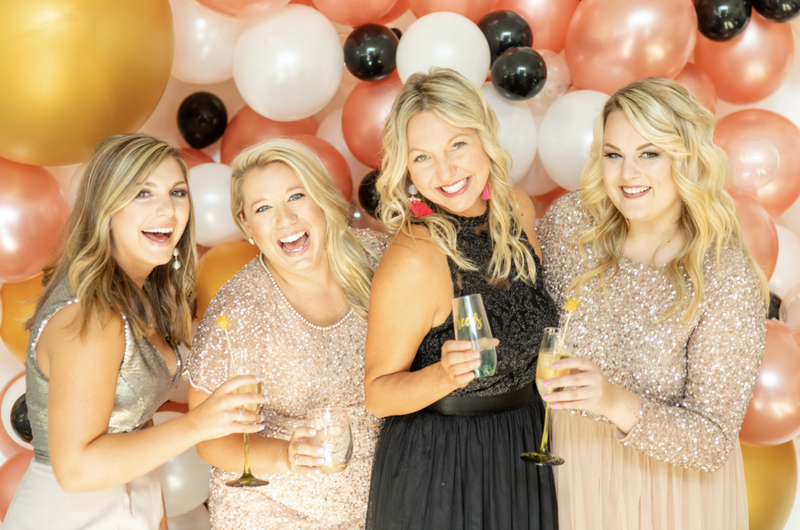 Mingle is an Asheville, NC based wedding planning team of 4 southern ladies who know how to organize and design a party! We are a sucker for detail and specialize in creating personalized touches that create magical experiences and well-crafted events. Our calm yet focused nature and fun personality will help you feel at ease during your event planning process. Many of Mingle's events have been featured in the likes of Southern Weddings, the Ruffled blog, The Perfect Palette, Cosmo Bride, Style Me Pretty and Trendy Bride. Mingle was voted "Best Wedding Planner" in 2014 by Borrowed & Blue, and one of Mingle's weddings was voted the "Most Quintessentially Asheville" wedding of 2016. Mingle was noted as Wedding Wire's "Couple's Choice" in both 2018 and 2019 and has executed over 300 weddings to date. Mingle was also scouted as a premier wedding planner by The Scout Guide, Asheville in 2018. All of Mingle's planning + event design services provide some level of support and guidance with a primary focus on planning the logistics and executing the details. Mingle offers full wedding planning, partial planning and 60 day coordination as well as event design. With Mingle you will have confidence that your event is being managed with the utmost care with every small detail in mind. Fortunately, Corey Marino, an Asheville-based chef and entrepreneur, has centered her life’s work around just that – creating customized, delectable meals for the most important day of people’s lives. Formally trained in culinary arts at the prestigious Johnson and Wales University, Corey also brings 15 years’ experience in the food and beverage industry to her own business, having worked as a chef at Asheville’s very own Grove Park Inn. Four years ago Corey officially opened Catering by Corey with a simple mission – sharing her love of food and hospitality with others. Corey prides herself on every bite, striving for every dish to be one that you can’t stop eating and for her team’s customer service to be more than you could envision. This is exactly why Chestnut Ridge couldn't be more excited to partner with Catering by Corey to offer the best cuisine that your guests will talk about as one of the highlights from your event. Brittney Rice and her team of seasoned make up artists and hair designers want women to know makeup is amazing and it makes us all feel great on the outside, but whats more important is the beauty that lies within each of us. With combined 15+ years of experience in hair and make-up, you can feel confident that Brittney and her team of artists will make you look and feel flawless on your special day. Chestnut Ridge is honored to have such a beautiful vendor (inside & out) on our team of vendors. Melissa is a total Asheville native. She loves watching Asheville become such an amazing city but most importantly a destination wedding spot. Melissa feels so blessed to get to do what she loves on the weekends and still be with her sweet 3 kiddos during the week. Doing makeup for 16 years now, she’s enjoyed each and every minute of it. She’s grown her team to 10 beautiful, super talented ladies who also have a passion for empowering women through makeup and hair; combined they have over 90 years of experience! She looks forward to meeting each and every bride to fulfill her wedding dreams into reality. Leah Hamsho is owner and operator of Bella Solé Studio, Asheville's Premier Airbrush Tanning Studio. Leah and her team of professionals believe that the perfect accessory for your wedding day is beautiful, glowing skin! The mission at Bella Solé is to make every bride feel naturally beautiful. A tan should just enhance the beauty of everything else never take away from it! Bella Solé uses only organic, sunless tanning products from Infinity Sun in Beverly Hills, CA. Infinity Sun's high-end sunless tanning products contain anti-oxidants and pure botanicals to deliver glowing bronzed skin that is never orange. This tanning solution is paraben-free and cruelty-free. Bella Solé's spa-like environment is perfect for hosting your bridal tanning party! We offer several bridal packages to ensure you are glowing for all of your bridal and wedding events. We'd love the honor of helping you feel truly radiant on the most important day of your life! Life is too short not to celebrate every moment. Anastasiia Photography exists to capture the beauty in the raw, unplanned moments of the most important day of your life. Though a photographer, she considers herself a storyteller. The truth is, most photographers can shoot nice portraits but it takes a lot more than that to capture a story – the way he looks at you when he sees you for the first time, the glistening of your father’s tear-filled eyes during the father-daughter dance, or the smug expression of the flower girl who thinks that this wedding is for her as she meanders down the aisle. Anastasiia is passionate about capturing every raw, beautiful, funny, heartfelt, romantic, emotional moment that takes place on the most important day of your life. Though every wedding day has to come to an end, photographs have the incredible ability to live on forever, allowing us to remember and re-live every special moment. Anastasiia loves what she does and makes lasting impressions with her clients sharing the same vision as Chestnut Ridge. We are excited to offer her in-the-moment photography for all of beautiful moments it embodies. Click here for recent work with a Chestnut Ridge bride + groom. Kathy Beaver, creative and owner of her own photography is based out of Asheville, NC. Mother to a beautiful 16 year old, Kathy has a rooted love for the month of October, coffee, chocolate, a good book, and laughter. Always seeking beautiful light (in photography and in people), Kathy has been know to get up crazy early just to watch the sunrise. Amber Hatley, wedding photographer based in Asheville, NC, is a believer, wife to my college sweetheart and mom to our sweet baby boy! It’s her purest belief that weddings are a celebration of sacred commitment and that strong marriages are foundational in creating time-honored legacies of love. Amber has served over a hundred brides & grooms and never tire of the thrill of it - big bouquets, inherited heirlooms, classically-styled couples, and effortless romance. She is proud to be a Blue Ribbon Vendor for Southern Weddings and honored to be featured in numerous publications! It's her goal to create genuine, romantic, and timeless images that you will treasure for a lifetime. Amber's mission: to capture your day as it happens naturally and provide you with photos that preserve moments that would otherwise pass away — photos that show how greatly you lived and how widely you loved on one of the biggest days of your life! We are so excited to have this bright spirit, and talented photographer in our preferred vendor collection! As a child, she watched her late grandmother make beautiful arrangements and work with beautiful brides as a florist. Surrounded by flowers and family, it was natural for her to learn a love for weddings. Gabrielle swoons at the festivity and romanticism of weddings. Weddings are beginnings. They deserve celebration and pomp; they deserve flowers and sparklers and elegant detail. A wedding is life's ultimate beginning, and being able to witness, photograph, and document these celebrations is the joy behind Gabrielle von Heyking Photographie. "That's the kind of beginning I live for. That's the kind of beginning I'm passionate about. And when the flowers he gave you on your first date have turned into the flowers you're clutching as you walk down the aisle to meet him at the altar-that's the beginning that I want to photograph. " Specializing in medium format film she has been serving clients in the Carolina's and around the world for almost a decade. Born in England, Rachael moved to the States after receiving her BA in Fine Art. Thrilled now to call Asheville home, she is constantly inspired by the beauty of our Blue Ridge Mountains. Her images are vibrant, romantic and timeless. She capture's every detail and fleeting moment in the most un-intrusive and editorial way and her calming presence on a wedding day put's everyone at ease. She's devoted to creating images that hold meaning, tell stories and showcase her couples living their best life. Rachael is deeply motived to providing you with not just amazing wedding photography but also the greatest experience possible. Nettie's Bakery is owned and operated by mother and daughter Pam and Kristin Allen. From family recipes that have been passed down from generation to generation, Kristin & Pam have created an art of getting to know their clients and enjoying the excitement that comes along with unique sweet treats for all their clients. Chestnut Ridge has the pleasure of knowing Pam and Kristin within their local community, and their easy-to-work with attitudes allows their creativity to be shown in each of their artistic cakes, pastries, and decadent sweets. 50/Fifty is Mandy and Chris Butler, a husband and wife team who have brought their dream of opening a dessert and pastry business to Asheville, North Carolina. Mandy and Chris named their business 50/Fifty because they believe in the importance of balance - both in the flavors of desserts and in life itself. They believe that creating that balance takes years of experience and commitment, as well as an artist’s special touch. Together, Mandy and Chris want to share their love of desserts and their extensive experience in the culinary and pastry industry into the art that is 50/Fifty. Whitney Randall, Lead Designer for Asheville & Western North Carolina. Urban Farm Girl supplies organically grown cut flowers, raised from seed to bloom to the community for weddings, special occasions and events. Elaine Young along with husband Bryan and son James moved to Western North Carolina in 2006, concluding a 20 year career as architects, designers and co-business owners in Birmingham, AL. Their desire to get back to nature was the driving force that led them to the mountains and allowed them to be a part of the community and finally take hold of their life long love of growing flowers. Elaine and Bryan draw heavily on their design background to create unique arrangements that beautifully balance color, texture and proportion. Many months of preparation is devoted to selecting a large variety of flowers in a broad color palette that produce radiant blooms all summer long. Customers can count on long lasting arrangements, as the flowers are raised with love and are all “fresh cut” daily. Chestnut Ridge has worked with Urban Farm Girl for many years, and we're excited to continue our relationship with them as one of our top preferred vendors. Meet us – Adrienne, Alan & Audrey. Together they own this fun company and their super sweet design studio & shop in Biltmore Park. They love what we do, any kind of celebration and they would say "WE. LOVE. FLOWERS." Their Team appreciates their flowers being noticed so each arrangement is unique – using only the freshest product – locally harvested when possible - and shipped from all parts of the world when not. Creativity is certainly our specialty. Through our wedding and event design, our paper store, the Baggie Goose, the best gift store ever, and customized floral with every order, you will find this artistic enthusiasm with every project. They provide a floral creativity that is definitely a step beyond and by using them, they will truly take your design to the next level. Dottie Edwards is married to Joel, mother to Stephen, Laura, David, mother-in-love to McKenzie and grandmother to Griffin. Dottie has been playing in flowers since she was 9 years old. “Art, flowers, and celebrations have been an inspiration of love and hope throughout my life.” As Dottie’s nest was emptying, she began to formalize her business goals and dreams and Inspired Design became a reality. Using locally grown flowers as much as possible. Dottie’s garden is a big resource for cuttings from shrubs, grasses, flowers, and unusual textures and pods. Whatever is needed to bring about the desired style whether garden, modern, boho, or farm, they are an excellent resource and capture years of experience. Every event is unique and personal to the Inspired Design Team. Inspired Design is a floral and event styling boutique where work flows out of hearts seeking to love people through a business that designs and delivers florals and décor for celebrations of life. Making florals and décor to reflect our clients story is the way they deliver more than flowers…we deliver a memorable experience. Founded by Atlanta native Bethany Thames in 2016, Joy Unscripted is quickly becoming one of the most respected and sought after lettering artists in the Asheville area. Joy Unscripted does everything from creating specialized wedding signage to designing your new monogram or even wedding websites! She has always been a creative at heart, and when she moved to Western NC, decided to highlight her exceptional talent for all things lettering. She quickly entered the community in high demand, and has grown her business by creating everything with her own unscripted design that fits your unique style. Service is everything, especially when it's comes with a side of fun and reliable. By using Cordial & Craft for every bartending need at Chestnut Ridge, we're able to guarantee their staff that will make sure your event is truly memorable and exactly how you imagined it would be. Founded in 1996, PPR has come a long way from its beginnings with a young couple, a single truck, and a few tables and chairs. Not long after planning their own wedding, Jeff & Dorie Fann decided the Special Events Industry was the right fit for their entrepreneurial spirit, and Greenville, SC was the perfect place to start. Jeff’s work experience with an event company in Atlanta combined with Dorie’s creative talents for design and décor would eventually develop in to a full service party & event rental company. Now with over 60 employees, 20 trucks and 70,000 sq. ft. of warehouse space filled with rental inventory, PPR is ready and willing to help our clients take their events to the next level. And as we look back upon our humble beginnings, we would like to extend our sincere gratitude to so many wonderful friends who have made all of this possible. THANK YOU to our outstanding team of dedicated employees, and to our loyal clients who have provided so many amazing opportunities for PPR to showcase our talents! Rachel Trantham has been a travel agent with Time to Travel, Inc. since 2017. As a Western North Caroline Native, not only is she vastly familiar with the Asheville/Canton area, but she is also a Certified Sandals Specialist who can help you plan the most amazing honeymoon. Regardless of your honeymoon destination (Sandals, a tropical island, or any other destination of your choice) she will make your experience personalized, and stress free trip! Knowing that every good and perfect gift is from above, they take this journey seriously, and will work tirelessly to serve the most premier product to the communities that Clean Juice is placed in. At Clean Juice®, we all believe wholeheartedly in a HEALTHY BODY & STRONG SPIRIT, and aim to provide the opportunity to use Clean Juice® to apply this to your everyday life.